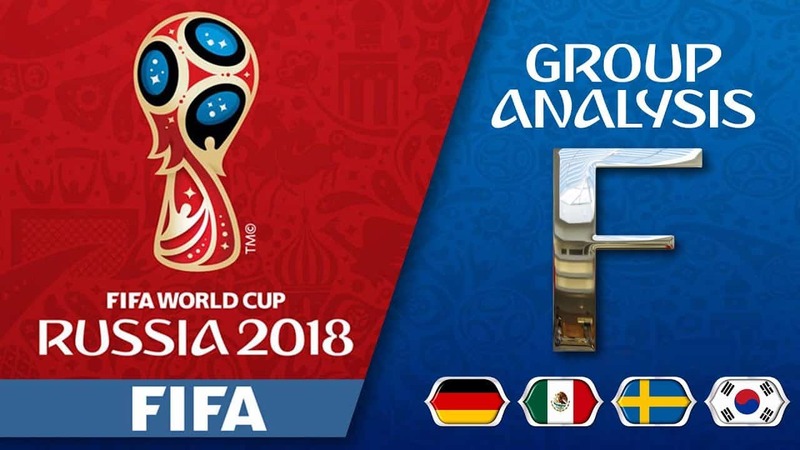 World in Sport’s coverage of the World Cup carries on, and we reveal our predictions for group F.
The World’s #1 ranked team by FIFA is also the favorite to win group F. Germany looks to hoist their fifth trophy at the World Cup, while also defending their 2014 win in Brazil. According to the odds makers, Mexico and Sweden present equal challenges behind Germany in the battle for the second spot in group F. Listed at 5/1 and 6/1 in group play respectively, Mexico and Sweden will meet on the final day in a match that could decide which team moves on and which goes home early. South Korea can hope that the three clubs get all twisted up during group play, looking to essentially steal their way in to the knockout round. Let’s reveal the four teams that will be competing in group F, as well as the schedule. Quick notes about the history of each team at the FIFA World Cup. Germany has the potential to join Brazil as the only five-time winners of the World Cup. Since the opening event in 1930, Brazil (5), Germany and Italy (4) have won 13 of the 20 tournaments played. Germany / West Germany has advanced to eight finals, six coming under the distinction of W. Germany. Mexico hosted the 1970 and 1986 World Cups, but success has eluded El Tri at the Major tournament. Success at the CONCACAF Championship / Gold Cup includes wins as recent as 2015, having won 10 titles overall from the two competitions. At the World Cup, however, Mexico is hoping to avoid a seventh straight exit in the round of 16. They did reach the quarterfinals in each of the two events they hosted, those being their best finish at the event. Sweden can at least take responsibility for leaving Italy out of the Major event, if nothing else comes out of it. In reality, that should only lift their expectations because of the result. Sweden was facing a potential third straight failure to qualify for the World Cup, as they faced one of the teams with a massive history in the UEFA Playoff. South Korea has the obvious task of having to over achieve at the World Cup in 2018. Listed at +1400 by the line setters in group F, they are, naturally, underdogs in all three contests they are facing. Ranked 61st by FIFA, they are among the lowest-ranked teams in the entirety of the competition. Only Saudi Arabia (67) and Russia (66) appear further down the rankings than the South Korean team. How does it all work out and which two squads are moving on from group F? Valid questions, so let’s see if we can answer them. For the team roster and other highlights, check the Germany team page. Germany routed hosts Brazil en route to their finals meeting with Argentina in the 2014 World Cup. FIFA revealed that over 1 billion people watched that final game, and it took 113 minutes to find the first and only goal in the match. Germany’s Mario Götze will forever have his credit for scoring the game-winning goal in the 2014 World Cup. There is ridiculous and then there is what Germany did in UEFA World Cup qualifying! Germany landed in group C in the UEFA portion of qualifying, and proceeded to win all 10 matches outscoring their opponents 43 – 4. Runterschlagen! That almost brings us back to those West German teams who were simply ready to beat you down just for showing up. Granted, the likes of San Marino and Azerbaijan appeared in the group, but that is still just astounding. Spain took all 30 points in their 2010 UEFA qualification process and they lifted the trophy in South Africa, so history helps that perspective. Germany had 20 different goal scorers account for those 43 goals in UEFA W.C qualifying. There were only 12 out of 54 teams that even scored 20 goals as a whole in UEFA qualifying. Thomas Müller tied for the lead with five goals in qualifying, and Sandro Wagner was responsible for five of his own tallies in the process. Wagner’s re-emergence at Bayern Munchen this past campaign, bolstered his potential to join the German squad in Russia. The 30-year-old Munich native is just now getting a taste of International football. With only 8 caps to his credit, he has only been with the German team since 2017. German manager Joachim Löw is apparently going to be bringing four forwards to Russia, Muller and Wagner among them. The other choices drew some criticism, because Wagner might have stolen a spot for Maarco Reus, as Timo Werner and André Schürrle appear to heave earned their way on the squad. Some decisions on the health of goalkeeper Manuel Neuer will have to be sorted out. He has not played since fracturing his foot in September, although he was officially on Bayern’s roster for the Frankfurt match in the German Cup final (did not appear). That could mean that Marc-André ter Stegen will be between the framework. In all honesty, these are two solid keepers no matter who appears on the pitch for Germany. We will know on June 17, when they open group F play against Mexico. The midfield presence for Germany will be evident throughout group play and beyond. Tony Kroos just got done helping Real Madrid take their third straight Champions league title. Sami Khedira just helped Juventus take an unprecedented seventh straight Italian Scudetto title. Julian Draxler was part of a PSG squad that took the Ligue 1 title this past campaign. Mesut Özil is playing in English Premier League with Arsenal, known for his composure and ability to press in transition. I mentioned Mario Götze and he, too, is back in the German midfield. All he has to do to top 2014 is score the game-winning goal in the finals again. Wouldn’t that put someone in legendary status? Like once wasn’t enough, right? Continuing our quest for answers, which of these three squads will be joining Germany in the next round? Let’s start with Mexico, and see if they will be moving on or not. For the team roster and other highlights, check the Mexico team page. Qualifying out of CONCACAF, Mexico was granted a bye to CONCACAF’s fourth round, which is essentially group stage. There are only three groups of four who play a round robin, and the top-2 from each group advance to the final phase. All six nations played a home and home series, 10 matches overall, and the top three automatically qualified for Russia. A half-bid came out of CONCACAF, and a half-bid came out of the Oceania Federation. Honduras fell to Australia in the Inter-Continental Playoff, leaving CONCACAF with only 3 teams at this year’s World Cup. Mexico was the best team in both stages of CONCACAF W.C qualifying. El Tri grabbed the top spot in the fourth round’s group A, before earning top honors in qualifying ensuring automatic entry. There is this great formula for success when playing football at a high level. Score more than your opponents and give up the least amount of goals. Well, Mexico pulled that off nicely in qualifying, scoring 13 goals while giving up just one in group A. Then, El Tri scored 16 more goals while allowing only 7 in the final phase, holding a +21 ratio from all 16 matches played throughout the entire process. Oh, and let’s not forget to mention that they only lost a single game in qualifying overall. Their lone 3 – 2 loss was to Honduras, who needed the result on the final day to earn the half-bid out of CONCACAF. Mexico had already clinched the top spot in the group before the final match was even played, so going undefeated was not necessary for Mexico, who had already had their plane tickets booked for Russia. Mexico Captain Andrés Guardado has earned 144 caps out of the midfield, incredibly, at only 31 years old. In comparison, defensemen Rafael Marquez has 143 caps, and he recently turned 39. Mexico has two 29-year-olds with triple-digit caps, one in the midfield and one up front. The man up front is arguably the most recognizable, as Javier ‘Chicharito’ Hernandez is on the brink of scoring his 50th goal with Mexico. Hernandez has found the net 49 times for Mexico, and is their all-time leading scorer.Chicharito had a pedestrian campaign with West Ham in EPL this past year, amid rumors he was on the trade block. Giovani dos Santos is the midfielder carrying 103 caps with Mexico, and his half-brother Jonathan dos Santos will feature in the middle of the pitch as well. The two play for the LA Galaxy in MLS, where forward Carlos Vela also plays at club level. Vela, however, is playing with the expansion franchise LA FC of MLS, who currently sit in second place in the Western Conference standings. Oribe Peralta is the veteran on the front line, as the 34-year-old plays with América of the Mexican League. Peralta helped lead America to their fist CONCACAF Champions League title in 2016. Speaking of America, goalkeeper Guillermo Ochoa got his debut with the Mexican outfit in 2004. Ochoa spent the last season with Standard Liège of the Belgian First Division, who finished sixth in the league table. Fellow net-minder José de Jesús Corona is the Team Captain with his club Cruz Azul, where he has been since 2009. The two might both get opportunities to appear in this year’s World Cup, both bringing experience to the mix regardless. They have combined to earn 144 caps between them, and each appeared throughout qualifying. For the team roster and other highlights, check the Sweden team page. Unfortunately, Zlatan Ibrahimović is not going to be wearing the #10 jersey for Sweden at the World Cup in 2018. Respecting his commitment to retire in 2016 from International duty, the chatter still arose to the potential of one last run for Ibrah. That all came to a screeching halt when Swedish manager Janne Andersson revealed his 23-man roster. Life goes on for The Blågult, but they got here without him through UEFA qualifying anyway. Sweden cannot afford to just be happy to be back at the World Cup in 2018. After an eight-year absence, Sweden has only appeared in two of the last five World Cups, each resulting in round of 16 exits at the 2002 and 2006 editions. Sweden are also partly responsible for why we do not see The Netherlands in Russia. France took the top spot in group A UEFA qualifying, while Sweden and The Netherlands tied on 19 points for the second position. The group winners get automatic entries to the World Cup, and France took that position with 23 points. Even though The Netherlands won and drew in their two group stage meetings, goal differential put Sweden on to the playoff round. Sweden’s 26 goals scored to only 9 allowed, outdid The Netherlands ratio of 21/12. Marcus Berg led Sweden in scoring in the UEFA qualifying stage, where they appeared in group A. In fact, he led all goal scorers from the group, finding the net 8 times for Sweden. Berg has accumulated 55 caps with Sweden, and has found the net 18 times for the National Team. Even though Jakob Johansson is a defensive-minded midfielder, he scored the only goal for Sweden in their playoff tie with Italy. After suffering an ACL injury in the second meeting, he will be absent for Sweden at this year’s World Cup. Expect to see a good bit of pressing from the Swedish defense, as they, too, contribute to the scoring. When forwards Berg and Ola Toivonen (3 goals in qualifying) were struggling, the Swedish defense had multiple players contribute off the back line in qualifying, getting three goals each from both Andreas Granqvist and Mikael Lustig. Granqvist took the Captain’s arm band upon the retirement of Zlatan Ibrahimović after the 2016 European Championships. He’s earned 70 caps with Sweden, but he scored three of his six all-time goals in this year’s qualifying alone. Vice captain Sebastian Larsson leads the team with 98 caps, providing stability in the back-end as well. For the team roster and other highlights, check the South Korea team page. South Korea is certainly facing an uphill battle in group F, but let’s not overlook how good this team is. As impressive as Germany, Mexico and Sweden were in their qualifying process, South Korea was just as dominant in AFC qualifying. South Korea were the only nation in Asian qualifying that ran off a perfect 8 – 0 record in group stage. That’s not even the impressive part of that statement. How about not allowing a single goal to anyone through the entire process? Now it’s starting to sink in, isn’t it? The Taegeuk Warriors have been a staple at the World Cup since 1986, this being their ninth-straight appearance at the Major event. While the odds makers may be overlooking South Korea, don’t think for a second that these three teams think they will be a pushover. Team Captain Ki Sung-yueng will be making cap #100 when South Korea opens group F play against Sweden on June 18. That is assuming he will not feature in any of their three final Friendlies before the World Cup. Goalkeeper Kim Seung-gyu has 31 caps to his credit with South Korea, and 16 of those were clean sheets. That math tells us that he is pretty damn good, when you do not allow a single goal in over half of your appearances. He accumulated seven of those cleans sheets in AFC World Cup qualifying as well. Dijon midfielder Kwon Chang-hoon was likely to appear for manager Shin Tae-yong, but an unfortunate Achilles injury on the final match of the Ligue 1 campaign will leave him off the final roster. If defense wins championships, then South Korea fits the bill. It will just be a matter of if they can score enough to keep pace in group play. Despite the fact that 3 straight European nations have won the World Cup, Germany is among the favorites to win the entire tournament. Winning back-to-back World Cups would also be quite a feat. There is pressure to not just go deep in the event, with the goal being to hoist the trophy again! The betting public would love to see South Korea advance with Germany, listed @ +600 at BWin to both advance from group F.
There seems to be a story in every World Cup, where we see a team advance who wasn’t even given a chance to succeed. South Korea could provide that story, but draws will not be enough. Mexico and Sweden aren’t exactly all that respected by the line setters in Russia. Both are listed at +10,000 and +15,000 to win the World Cup, respectively. With a bit of surprise, we will offer this finish for the four team in group F.
Germany and Sweden to advance is listed at +230, and that is where your value should be found. In addition, if this is indeed the order in which the group finishes, BWin has that prop listed at +975. As risky of a proposition as it sounds, it will all hinge on the success, or lack there of, from Mexico. This will be a little more of an exciting group than some might be expecting. Enjoy the matches, and we hope you are enjoying our World Cup previews and predictions.